Angels and cherubs are popular motifs for holidays such as Christmas and Valentine's Day, and these free crochet angel patterns are excellent options for either of those celebrations. Crochet angels don't just have to be for special occasions, though. They add hopeful symbolism to home decor at any time of the year. They are great in nurseries and they can also be placed on tabletops and mantles throughout the home. This crochet angel pattern was originally published in CrocheTrend and is now available as a free pattern from Ravelry. 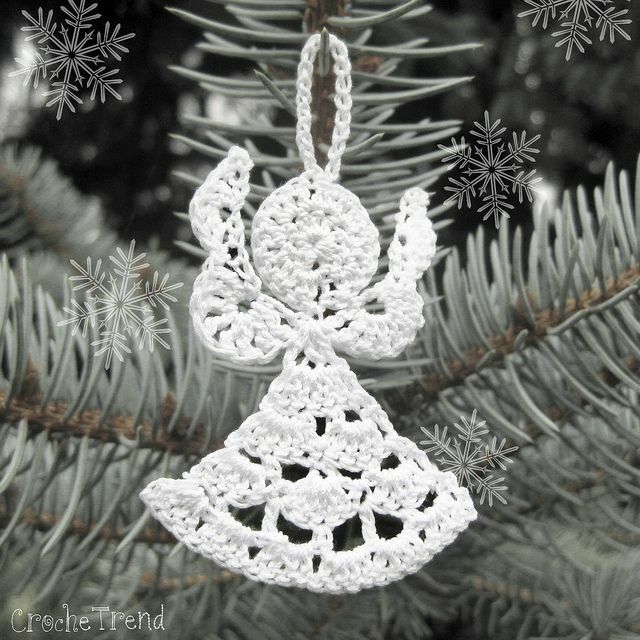 This is a very classic angel pattern, designed in white cotton thread as a lacy Christmas ornament. This crochet angel is worked with a size US 7 steel/1.5 mm crochet hook and is just over three inches tall. This size is great for a Christmas tree ornament but you could also make a whole set of these to string together for a holiday bunting. This is a small crochet angel ornament pattern that works up really quickly, making it great as a last minute gift or decor item. The wings on this one are made from looped yarn, making it a design that is different from all the rest. Crochet designer The Cookie Snob offers this free pattern as part of a set of Advent ornaments, all quick patterns that include a Christmas gift and a Rudolph reindeer. Enjoy making this free crochet pattern from Suzie's Yarnie Stuff. The angel itself is 2.75 inches, with a bookmark tail that brings the total size to 13 inches. This is a great gift for the bookworms in the family. Suzie also has a version without the bookmark tail that can be used to create an angel crochet ornament. This angel is designed to be made with size 3 crochet thread and a size E (3.5 mm) crochet hook. Notably, you could adapt any angel pattern to a larger design by using thicker yarn and larger crochet hooks. This is another free crochet angel pattern designed by Suzie's Stuff, but it is completely different than the design for the bookmark pattern. The crocheted part of this project is super simple. The angel is created by adding mixed media materials including ribbons and jewels. The finished item is intended as a pin (brooch) or magnet, making this a really great item to craft for gift giving. This free pattern comes in two sizes: a smaller size that is a little more than two inches across each wing and a larger size that is 3.5 inches across each wing. This free crochet angel pattern is designed as a three-dimensional item that can be used as a Christmas tree topper or a table centerpiece. It is worked in the round, using size 10 cotton thread and a steel size 8 (1.50 mm) crochet hook, and is considered to be intermediate in difficulty level. It has three staggered rounds of pineapples and full sleeves and holds a rose; it's truly a beautiful, impressive crochet angel. The finished size is 11 inches tall. This 5" crochet angel is small enough to hang as an ornament but large enough (and in three dimensions) to sit on on a table. The little halo on top is crocheted with bow wire, giving it a little glitter. The texture on this angel is created by using front post stitches (both single and double crochet). This is such a beautiful crochet pattern because of the many intricacies in each part of the angel. The skirt is made from a series of different crochet petals. The wings have a spiral style to their design. This angel ornament is lacy, decorative and precious. This unique crochet angel pattern begins with a lacy square that is rotated on its corner and folded to create the basic shape of an angel. Ribbons and pearls make up the rest of the design. There is a YouTube video to assist you in constructing this crochet angel. This crochet pattern puts a twist on the regular angel by making it a mouse instead. It is a fun little toy that is perfectly squeezable and it makes a great Christmas present. This crochet mouse pattern is worked with double-stranded yarn, and one of the strands is a novelty yarn, which gives it the soft cuddly feel but also makes it a more advanced pattern. Classic crochet angels are not the only option that you have; you can also make crochet angel wings. These are small wings that work great as a pair of crochet earrings. They can also be hung as Christmas ornaments or sewing on to the backs of baby's shirts as appliqués.